Does your skin need an extra boost to fight off what seems to be everyone's problem - aging? Do you need a quick beauty solution that will let you say goodbye to dull and dry skin in a matter of weeks? If your answer to both questions is 'Yes', then this blog is a spot on for you! 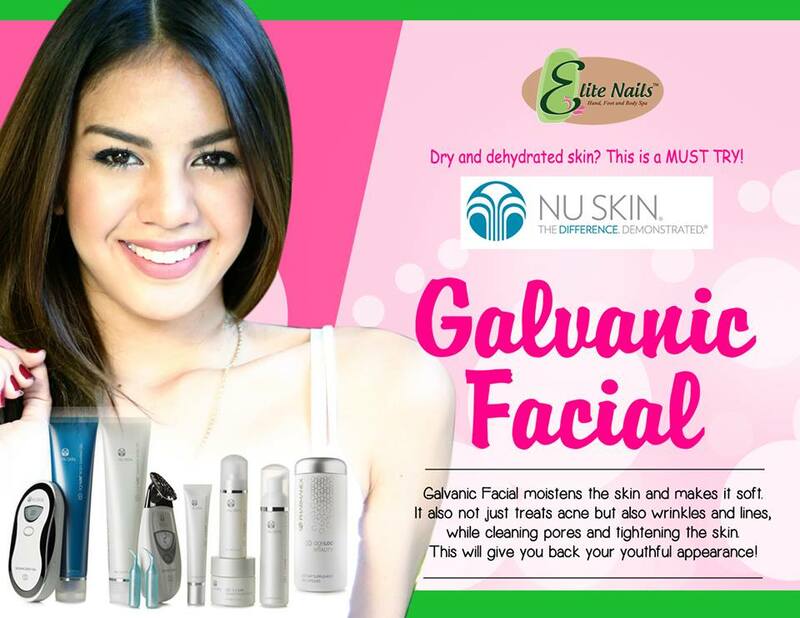 If you think you're doing your best in terms of cleansing and moisturizing and yet, you are not satisfied at what you see in the mirror, let Elite Nails Spa introduce you to the amazing wonders of Nu Skin Galvanic Facial Treatment and a promising beauty switch you can start today. The Nu Skin Galvanic Facial can actually give the satisfaction that we all desire to have - a younger, healthy-looking skin. This amazing discovery on technology and cosmetics is something we should be thankful for. Thru NuSkin Galvanic Facial Treatment, we can now take aging one step backward. The Nu Skin Galvanic Facial consists of a hand held Galvanic device with the ageLOC face conductor and the specially formulated gels with ageLOC - the revolutionary blend of ingredients that target the source of aging in skin and stop it. While the current stimulates cell rejuvenation in your face, the gels help eliminate toxins and impurities from your skin and minimize your pores and allow them to breathe. These tools are all you need for a promising result that delivers innovative, comprehensive and exclusive anti-ageing opportunity that will transform the way you age. If you want to experience the wonder of this treatment, visit the nearest Elite Nails Spa branch to you or call for appointment today.